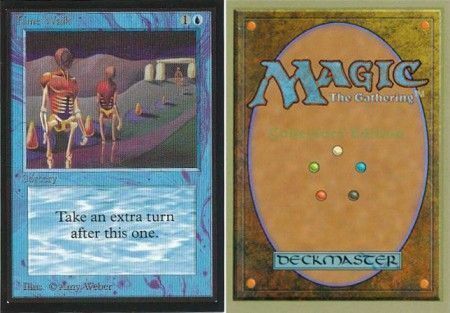 Counterfeit Magic cards have been around for a long time, lurking just beneath the surface of the Magic community. In fact, the addition of the hologram to Magic cards in Magic 2015 was at least in part an effort to cut down on the flood of counterfeit cards coming out of China by making it more difficult for people to make fake cards. However, things have changed in the last year or two. Legacy staples, especially cards on the Reserved List, have gotten insanely expensive, and we were talking just last week about how the lack of good Modern-focused Masters sets had caused the prices of the format to increase 26% this year. As cards get more expensive, making fake cards becomes more lucrative, in part because the number of players who can afford a legitimate Underground Sea or a playset of Mox Opals gets smaller and smaller. 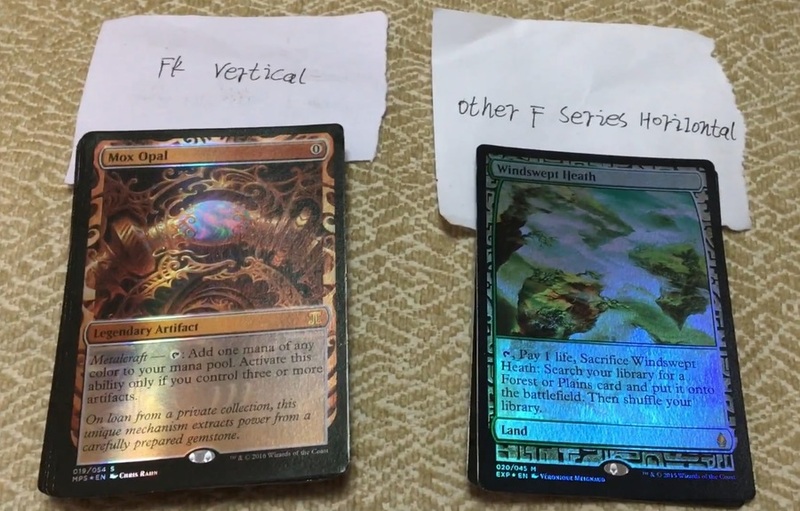 This has led to a huge proliferation in the counterfeit card subculture, which now has YouTube channels reviewing these cards, a subreddit devoted to helping players find the most realistic counterfeits, and even (supposedly) a ring of players intentionally playing these cards at large events like Pro Tours and Grands Prix in an attempt to prove just how realistic these cards have become. This influx of interest in fake cards has pushed the counterfeiters to new heights—just look at the "progress milestones" of one major counterfeiter above. In just the past four months, they managed to add holograms, start counterfeiting foil cards, and increase the number of cards they offer by more than 300%. In the past, the main concern was random, expensive, old Reserved List cards, which are comparatively easy to counterfeit. Now, the counterfeiters are making foils, FNM Promos, and Judge Promos. They are also making newer cards—even Standard-legal cards like Teferi, Hero of Dominaria and Chandra, Torch of Defiance—complete with the hologram intended to protect against counterfeiting and verify a card's legitimacy. Basically, we've reached the point where any Magic card—down to Expeditions, Inventions, and other Masterpiece-series cards—can be counterfeited, and with the cost of real Magic cards on the rise, especially in older formats, there is a huge incentive for the counterfeiters to hone their craft and make their fake cards as realistic as possible. This is a bad thing for Magic players, local game stores, Wizards, and the game as a whole. To me, this seems obvious, but based on some of the conversations I've seen on Reddit and social media, a meaningful number of Magic players don't see it this way. So today, we're going to take some time to talk about why fake cards are a problem; why you—if you care about Magic—shouldn't buy counterfeit cards, even for your own personal use; and what can be done fix the problem. Let's start with the basics: counterfeit or fake Magic cards are Magic cards that aren't printed by Wizards ,and they are made to be as much like real cards as possible, with the goal being to fool people into thinking they are authentic Magic cards. Most of them come out of China, and while I'm intentionally going to avoid linking to any place that sells these cards in this article, they are extremely easy to find on the Internet without much work at all. Traditionally, it was old, expensive Legacy and vintage cards like dual lands and the Power Nine that were faked, but now the counterfeiters have expanded their operations to include all Magic cards. While generally speaking it's still expensive cards that are counterfeited, some of the printing operations allow you to quite literally order any card you want, and they will print it for you, so no card—hologrammed, foiled, or normal, or cheap or expensive—is 100% safe from being counterfeited. How Realistic Are the Fake Cards? Let's start with the good news: I've never held or even heard of a counterfeit card that was so realistic that you could hold it in your hand unsleeved and think it was a real Magic card. While some of the cards look extremely realistic to the naked eye, especially through a layer or two of sleeves, fake cards feel weird—sort of glossy or waxy and more like a playing card than a Magic card. Apparently, the new hologrammed and foil cards have their own set of issues, with the hologram sticking out more than it would on a real Magic card and the foiling process being different than the original. 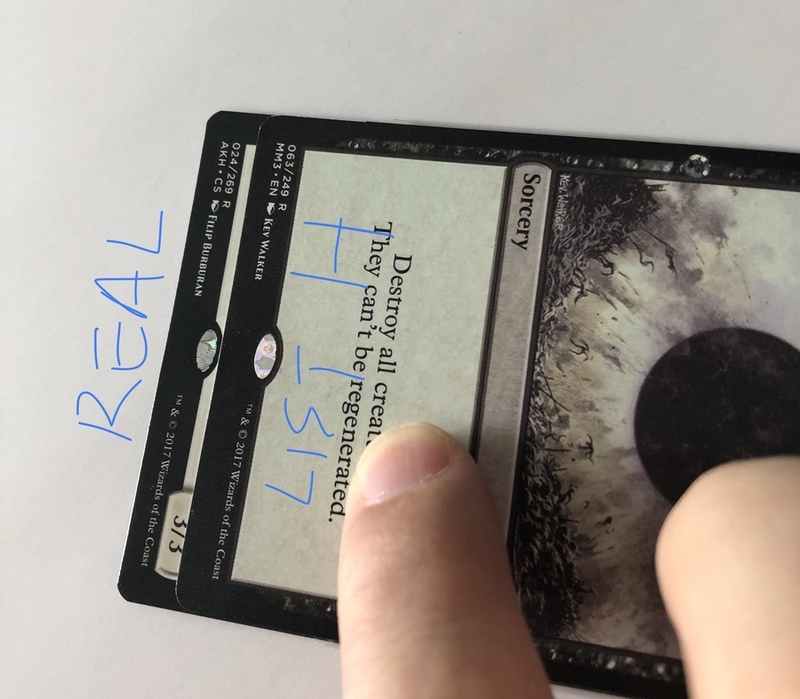 As such, if you've been playing Magic for a while and have touched a lot of Magic cards, you'll likely know that a card is fake as soon as you pick it up unsleeved. On the other hand, it's very possible that newer players could be fooled, especially when it comes to older cards that occasionally feel weird even if they are real, thanks to variance in the printing process, or things like Masterpieces that have a strange foiling process. 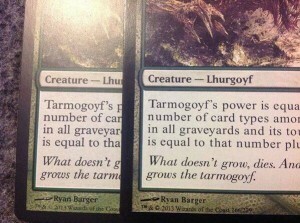 A fake Tarmogoyf on top of a real Tarmogoyf. Notice the weird spacing in the text on the counterfeit card. The other issue is that counterfeit cards are steadily improving. Five years ago, most counterfeit cards were laughably bad, failing just about every test imaginable and often looking wrong at a quick glance. Today, most counterfeit cards are designed to pass various tests like the bend test and the light test, and some look almost exactly like the real thing, even upon close inspection (unless you're going really deep and using a jeweler's loupe, which is a good way to weed out fakes but too much work for the average player). It's also likely that fake cards will continue to improve rapidly because there's a ton of money to be made by the counterfeiters, and with several or even many different operations making fake cards, each individual counterfeiter has an incentive to keep improving their "product" to stay ahead of the competition. As such, the bottom line is that current fake cards are extremely unlikely to pass through the hands of a long-time Magic player without being detected but may fool newer players, and the best of the current counterfeit cards are very likely to pass unnoticed through tournaments, especially when double-sleeved and only seen from across the table. The counterfeit card community doesn't refer to its fake cards as "fake" or "counterfeit"; it calls them "proxies," which seems to be an attempt to lend legitimacy to their buying and selling of illegitimate Magic cards. Unfortunately, this causes a lot of confusion, since the term "proxy" has been a part of Magic for a long time and the use of proxies is widely accepted for certain purposes and types of play. 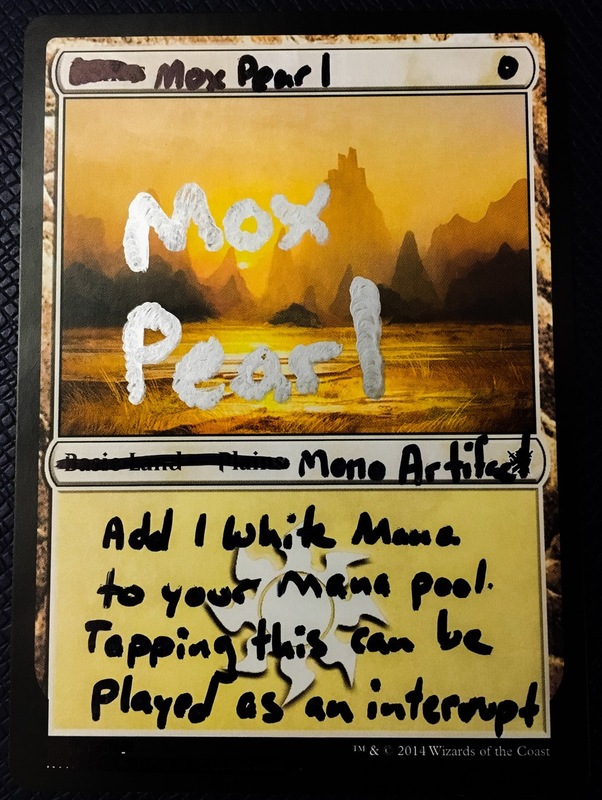 Technically, a proxy is any stand-in Magic card, so technically a counterfeit card is a proxy, while writing "Underground Sea" on a basic land with a Sharpie also makes a proxy. On the other hand, counterfeit cards are designed to be as realistic as possible to fool people into thinking they are real, so while all counterfeit cards are technically proxies, not all proxies are counterfeit cards. True proxies are a healthy and important part of Magic. Not everyone can afford to own every card, and if you want to pretend something else is an Underground Sea for testing or on your kitchen table, that's great. On the other hand, the goal of counterfeit cards is literally to fool people into thinking they are real cards, either for tournament play or to make a profit by selling the cards to unsuspecting players, which makes counterfeit card "proxies" problematic. 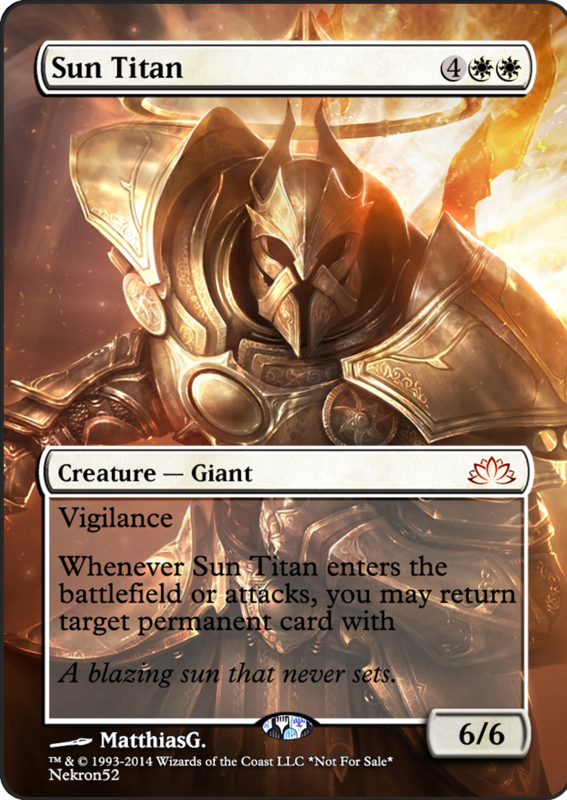 Proxy Sun Titan for a cube. Clearly marked "Not for Sale"
While there is some gray area involved and Wizards' relationship with proxies is complicated, proxies are generally acceptable for unsanctioned play. Some stores run unsanctioned Vintage events that allow proxies, while many people have some number of proxies in their cube or in their Commander decks. However, if a proxy is being used ethically, there is no reason that it needs to be realistic. Actually, there's no ethical or acceptable reason to make "proxies" to pass the light test, bend test, and other well-known tests to weed out fake cards because there's no ethical or acceptable use of proxies that requires the proxy to be as similar to a real card as possible—a Sharpie on a basic Island does the job just as well and without any of the legal and moral issues. Proxy Liliana of the Dark Realms from @TheProxyGuy on Twitter, also clearly marked "not for sale"
The TLDR is that if you want to use proxies for unsanctioned play, that's great. Sharpie things up, make cool-looking (but clearly not real) proxies for your cube or Commander deck—that's not a problem. The problem is that counterfeit cards aren't "proxies" in the traditional sense because their intent is to deceive; instead, the counterfeiting community has co-opted the term to try to make what it is doing sound less bad and more acceptable. Don't fall into the trap of calling counterfeit cards proxies because it helps normalize their use in the community and reinforces their acceptability, which is a bad thing for the game, its players, local game stores, and Wizards. Why Are Counterfeit Cards a Problem? Which Underground Sea is the fake? Photo from Medium.com. One of the arguments I've heard in favor of counterfeit cards is that that the Reserved List makes it impossible to reprint things like dual lands, so players don't have a choice but to look for other more affordable options. In all honesty, I have some sympathy for that argument. The Reserved List is one of my least favorite things in Magic and is horrible for players. 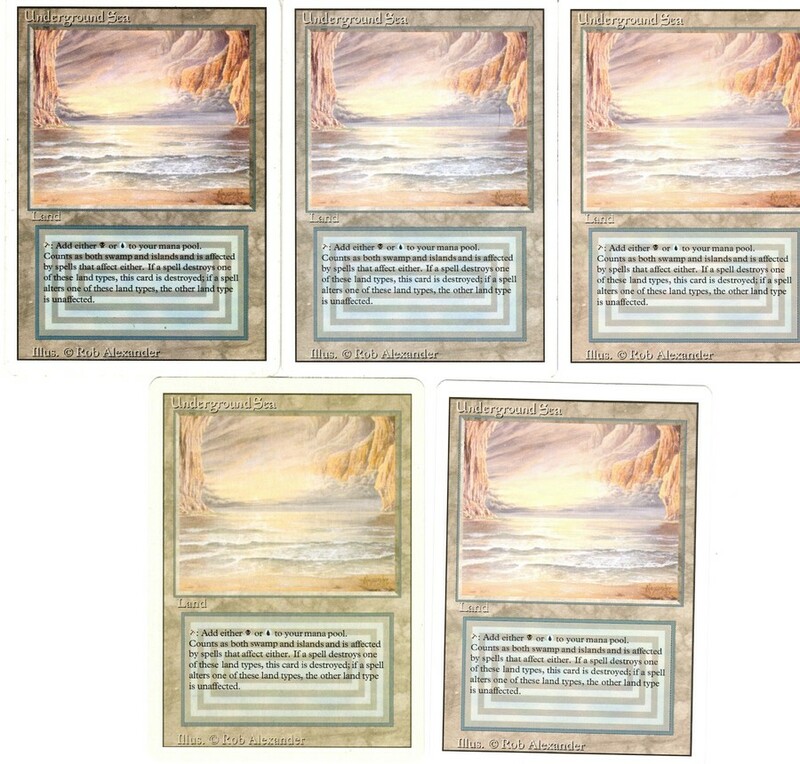 I can understand the impulse to use a fake $5 Underground Sea when the only other option available (thanks to the Reserved List) is a $2,500 playset of Underground Sea. While buying counterfeit goods is still wrong, regardless of the reasoning, if the extent of the counterfeit card problem was people trying to find a way around the Wizards-created problem of the Reserved List, I wouldn't be writing this article. The bigger issue is that, as we talked about before, it's not just (or even primarily) Reserved List cards being counterfeited. It's the latest hot Standard cards and most playable Modern cards as well. It's random $15 Commander cards that will probably be reprinted in the next year or two anyway. There are even people asking for counterfeit basic lands! If you hang around the counterfeit card subreddit, you'll find people asking for fake Aura Shards—a $15 card that isn't on the Reserved List and was already reprinted once in a Commander set. These cards—the random Standard mythics and the $10 Commander staples—are the bread and butter of most local game stores. When someone spend $5 to get a fake copy of Aura Shards instead of $15 to get an authentic copy from their local game store, it cuts into the already tiny margins that most LGSs have to work with. So, buying fake cards directly hurts your local game store, and if fake cards become too popular and widely used, it's possible that some stores simply won't survive, which leaves everyone—with fake or real cards—without a place to play Magic. Moving up the line, if it gets to the point where fake cards are indistinguishable from real cards (which is the stated goal of counterfeiters and the dream of at least a large portion of the counterfeit community), and once fake cards are widely available and accepted by the community (which is likely to happen if / once they are really indistinguishable from authentic cards, because how could you know if the card you were playing with or against was real or not? ), it could be a threat to the very existence of the game. Like it or not, Wizards is a business that needs to make a profit to survive. If everyone simply buys a fake $5 Teferi, Hero of Dominaria instead of a real Teferi, Hero of Dominaria (or a booster box to try to open a copy), this would be a massive hit on Wizards' bottom line. While some people have argued that Wizards would find a way to adapt and move forward like the music industry did in response to its piracy problem, perhaps by taking the game completely digital, personally, I don't have much faith that Wizards could completely reinvent the booster pack model it has been using for 25 years and be successful. It's more likely that after a few years of declining profits, we'd start to see layoffs at Wizards—supporting R&D is expensive—which would mean fewer new Magic cards and products (somewhat ironically creating a self-fulfilling prophecy, since less products would mean less reprints, driving up prices on cards even more and making fake cards even more appealing) until eventually Wizards just shuts its doors and Magic becomes a dead game. The third issue is other players. Let's say you show up to a Modern tournament playing a $150 budget deck like 8 Whack. Thing go well, and you only need one more win to make the Top 8! In the last round of the Swiss, you lose to someone playing a $2,000 deck overflowing with fake cards, missing out on the Top 8 by just a single match. While your response to this situation will depend mostly on you as an individual, with some people not caring at all and others caring a whole lot, at least some percentage of players would feel like the Top 8 (and prizes) were stolen from them. You only had $150 to spend, so you built the best deck you could with the money, practiced hard, and played well. Meanwhile, your opponent only had $150 to spend but they took their money to a criminal organization and ended up with $2,000 worth of cards in their deck. While my personal feelings on this aren't that strong (maybe because I don't play that much paper Magic), I certainly see how the 8 Whack player has the right to be angry and feel like they were robbed by someone who was cheating. It's possible that the 8 Whack player simply gives up and moves to another game after this experience. Finally, fake cards undercut confidence in the Magic market as a whole. Here, my primary concern isn't speculators or collectors but the poor college kid on Reddit trying to put together a Modern deck that ends up with fake Mox Opals off eBay, or the new player who thinks they are getting a good deal on some Modern staples to build their collection off Craigslist and hasn't played enough Magic to realize the cards are fake. While many in the counterfeit card community disavow selling fake cards to players, the fact remains that simply by handing your money over to counterfeiters, you are helping to improve counterfeit cards, make them more realistic, and assist other people in scamming other players. Since I've been talking about and researching counterfeit cards, a few themes have come up consistently among supporters of counterfeit cards. Since I'm sure these points will come up ad nauseam in the comments or on social media, let's try to head some of them off here. Magic is too expensive... Agreed. The Reserved List is silly, and Wizards has failed with its reprint sets over the past couple of years. While I believe some people have unrealistic expectations on how cheap Magic should be (and we'll talk more about this later), I 100% agree that Magic is too expensive and have dedicated a lot of time and effort to fighting for more and better reprints and the end of the Reserved List. ...so it's okay to buy fake cards. Discounting the legal aspects of the entire situation, this argument rings hollow, mostly because it's not just expensive cards that are being counterfeited. I might be able to see this perspective if the only counterfeiting problem involved dual lands, Power Nine cards, and other absurdly expensive, unreprintable Reserved List cards, but the demand for counterfeit Standard cards, $15 Commander cards, and Pauper staples works against the argument that the fake card problem is just about $600 Underground Seas and $2,500 The Tabernacle at Pendrell Vales. I only play with fake cards; selling them is wrong. Selling fake cards is wrong, and it's good that (most) everyone can agree on that point. Unfortunately, by buying fake cards, even for your own personal use, you are helping to improve the fake cards and indirectly making it easier for other, less ethical people to sell fakes to unsuspecting players. If you choose to send your money to counterfeiters, you're part of the problem. While you certainly are a smaller part of the problem than the people listing these cards on eBay or trading them away at Grands Prix, you're still a part. No Magic cards should be over $X, or else we wouldn't need fake cards. Counterargument: there are several threads on the forgery Reddit about basic lands (Beta basics, APAC promos). Basic lands are literally free at any LGS or Grand Prix in the country. In this case, the "X" really is equal to $0 and people are still trying to get counterfeits. Plus, there's no agreement with what "X" should be. I've seen people say $40, $20, $10, and even $0. My personal belief is that even if every Magic card cost $20 or less (which is a completely unrealistic and impossible goal), people would still be buying counterfeit cards. The combination of these two factors makes it seem significantly less likely that it's just about the price of cards. Magic is supposed to be a game, but the MTG finance cabal is driving up prices, so I have no choice but to buy fake cards thanks to those MTG finance scumbags. I don't love everything or even most things about the finance aspect of the game, but again, it's not like most of the forgeries going around are the $2,000 Reserved List cards that were bought out by speculators. They are random, not-that-expensive, and very reprintable Modern and Standard cards. 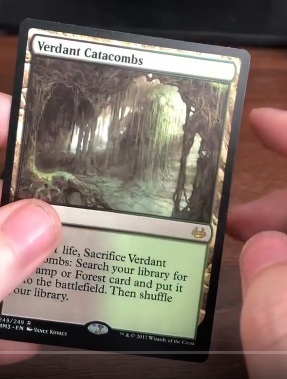 MTG finance has nothing to do with the price of Teferi, Hero of Dominaria or Chandra, Torch of Defiance, but these cards are still being produced by counterfeiters and bought by players. We just want to play Magic. Awesome! Make some sweet, non-realistic proxies and build a cube, a Legacy deck, a Vintage deck, or a deck for whatever other format you want to play, and have a blast! You don't need to replicate real cards exactly to do this though, or support counterfeiters who are enabling scammers. Also, not to harp on this point too much, but if it's really all about "playing Magic," why is there demand for counterfeiting basic lands? Everyone should be able to play Magic. I agree, and everyone can play Magic without buying or using counterfeit cards by using legitimate, acceptable proxies. On the other hand, if this is code for "everyone should be able to play tournament Magic with prize money on the line," then I disagree. While I'd like the game to be as accessible as possible, even on a tournament level, you shouldn't be able to build a $2,000 deck with fake cards and then expect Wizards to offer you prize money for playing its game. Building a deck—with authentic cards—is part of the entry fee into tournament Magic, and that's perfect fine. While everyone should be able to play and enjoy Magic, not everyone has to play tournament Magic, which is evidenced by the fact that a huge majority of the Magic community plays the game casually and couldn't care less about Grands Prix and Pro Tours. Clearly, a huge part of the solution to the counterfeit card problem is more effective reprints from Wizards. As we talked about last week, after doing a solid job after Modern Masters 2015, the last couple of Masters sets have been horrid for meeting players' needs. We need more and better reprints to support the Modern format. Hopefully, they will come soon because the current situation—with prices rising sharply—is certainly not helping the fake card problem. As for the Reserved List, it would be great if something would change, but at this point, I've mostly given up hope. While I'm not sure it's possible for Wizards to reprint away the counterfeit card problem (but more on this in a minute), finally doing some things we've been talking about for a while would certainly help to alleviate some of the pressure. This includes dropping the price on Masters set packs back down to $7, reprinting more cards that are expensive because they have a lot of demand (rather than cards like Imperial Recruiter that were expensive because they were low in supply), and refocusing reprint efforts to popular formats like Modern (either by bringing back Modern Masters or by making sure that themed Masters sets are stocked with expensive Modern staples). Wizards could also explore other products like the Modern equivalent of Challenger Decks, although personally I find it unlikely that this type of product would succeed because the amount of valuable cards Wizards would find it wise to put into a Modern preconstructed deck product would likely be a lot lower than what some players would like, especially considering unironic requests for moving Snapcaster Mage to uncommon or selling box sets of 20 fetch lands for $50. Another possibility would be more Collectors Edition cards (with gold borders). The Reserved List only covers tournament-legal cards, so printing Collectors Edition as a sort of "official proxy" is allowed under the current rules and could be quite profitable for Wizards, although it wouldn't help players who are interested in playing tournaments. Still, there's a huge group of players who want high-quality proxies for their cubes or kitchen tables, and Wizards could fill this niche, rather than having some percentage of these players hand their money over to counterfeiters. Meanwhile, local game stores can run more unsanctioned proxy events. Legacy and Vintage are great formats, and most players would be perfectly fine with playing against opponents with some number of proxies in their decks if it meant they could play their favorite format on a regular basis. Wizards clearly stated back in 2016 that it has no desire to police proxies, even for in-store play, as long as the events aren't sanctioned and the events are using traditional proxies and not counterfeit cards. Speaking of counterfeit cards, along with running more proxy events, local game stores should have a no-tolerance policy for counterfeits and make sure that the proxies used are not designed to fool players into thinking they are authentic cards. On the other hand (as I mentioned a moment ago), I don't think Wizards can reprint the fake-card problem away. The demands from the counterfeit community simply aren't realistic. Wizards isn't going to sell a $50 box set with playsets of all of the enemy fetch lands—it would be a horrible business move. It isn't going to reprint Modern until every deck costs $200 or less—this would be a bad thing for the game overall (while it's not worth getting into here, Modern needs to be more expensive than Standard, although it doesn't need to be nearly as expensive as it is today). Even with more effective, targeted reprints, the counterfeit card problem isn't going to go away. The counterfeit card community expects a reprint policy that would quickly run Wizards out of business and won't be happy with anything less. Combine these two things together—a community that is rightly angry about the lack of good reprints thanks to Wizards printing some astoundingly bad Masters sets over the past couple of years and a community that wrongly expects Magic cards to be unrealistically cheap, so cheap that Wizards couldn't stay in business if it actually met the demands—and it's hard to see how Wizards can easily solve the fake card problem, at least easily and cheaply. Something along the line of a scannable code on cards to verify authenticity would get the job done, but implementing the program would be costly, and it wouldn't help with all the cards that are currently in print (barring some sort of mass-exchange program, which would be even more prohibitively expensive). Things like holograms and new borders are fine stop-gaps, but counterfeiting Magic cards is so lucrative that it's worth the time and effort for the producers of fake cards to figure out ways around these security measures. While I can't control how Wizards reprints cards or control the over-the-top demands of the counterfeit community, I can appeal to the large majority of the Magic community that's filled with reasonable people who love the game of Magic to do what they can to help lessen the impact of the problem. First, we do need better and more effective reprints to bring prices down and should do everything we can to push Wizards in this direction. Having Modern prices rise 26% in eight months is unacceptable. Having tournament staples costing hundreds of dollars is unacceptable. The Reserved List has outlived its usefulness. Making sure that Wizards understands that we feel this way is important. 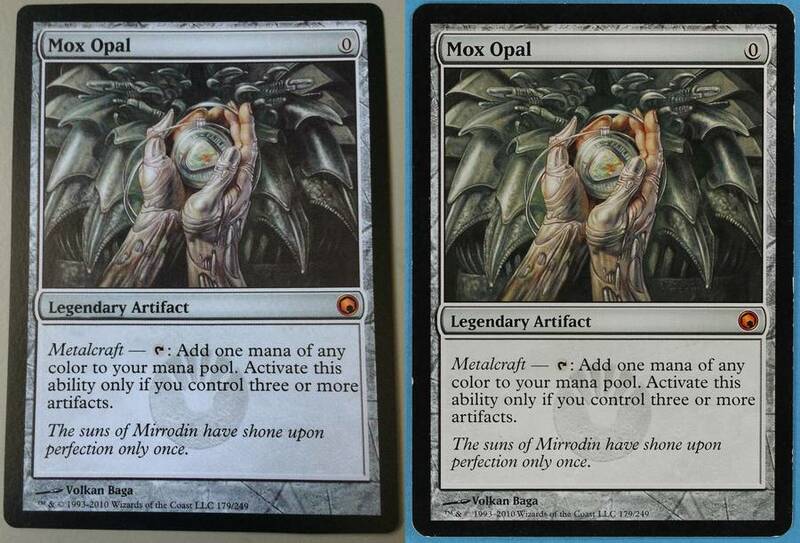 While better reprints can't solve the fake-card problem, it can help to lessen the impact of the problem, as some people who might be tempted by fake Mox Opals when the original is $100 will be less tempted at $50 after a reprinting. Second, we need to make it clear that counterfeit cards are not an acceptable part of our community. They are harmful to players, local game stores, and Wizards, and if things continue as they are, with counterfeit cards improving by the month, they could represent an existential threat to the game as a whole. Making Magic cheaper and more accessible to a wider range of players is a battle worth fighting, but buying, selling, and supporting counterfeit cards simply isn't the right way to fight it.